Image of how the proposed Bonham Quay development will look. 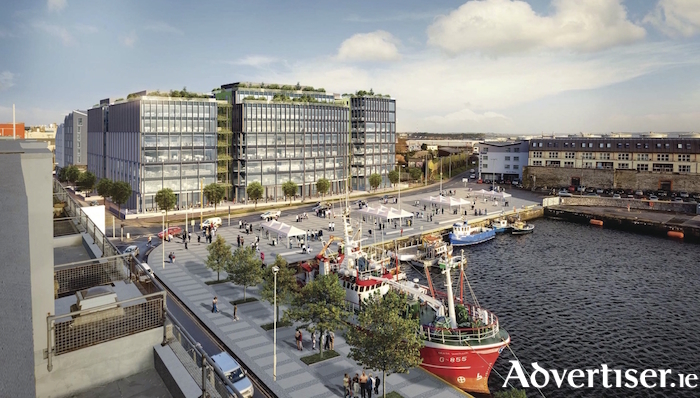 An Taisce's Galway Association has submitted an appeal to An Bord Pleanala against the Galway City Council's decision to grant planning permission for the proposed Bonham Quay development. The appeal contends that the planned development - which seeks to deliver more than 26,000sq m of Grade A Office Space to Galway city centre through four blocks, ranging in size from 4,820 to 11,845sq m, designed to allow multiple occupation - is, in its own right, in material contravention of several policies and objectives of the Galway City Development Plan 2017-2023. An Taisce argues the proposed development contravenes the requisite provision of residential content, housing policy, and objectives development and "will not contribute even one new family home to address Galway’s current housing need". The Bonham Quay development is expected to create more than 500 full-time construction jobs, and will cater for approximately 2,600 employees once operational. However a spokesperson for An Taisce said: "There is no residential accommodation whatsoever being proposed for the 2,600 office workers which the development is said to accommodate, this means most of the people who will work there will have to commute some distance to get to work." An Taisce also contends the proposed development "prevents unrestricted public access, engagement and interconnectedness" with the waterfront; overshadows and overlooks adjacent residential properties; would cause shadow-casts; visually impact adjacent amenities including protected areas such as the nearby St Nicholas Street; and contravenes prevailing plot ratio with site over-intensification - 3:75 plot ratio as opposed to designated 2:1. Further concerns expressed in An Taisce's appeal, focus on the proposed excavation and what the group contends is "the lack of sufficient detail and adequate address by the applicant, Edward Capital, and Galway City Council regarding "the safe removal and remediation of the 39,000 tonnes of highly contaminated soil infill" required to be excavated from the site. An Taisce is instead calling for the development of an inner harbour area, which, the group says, is "specifically addressed" in section 8.7, Urban Design - Regeneration Areas, Galway City Development Plan 2017-2023; “The regeneration of Ceannt Station, the Inner Harbour and Headford Road (south of the Bodkin junction ) provide major opportunities for high quality urban design to contribute to creating new vibrant areas which can attract investment and uses, provide sustainable residential communities and reinforce the urban structure."